It's also important to mention that some school districts have school-based health centers, which are an invaluable resource for meeting children's health needs. Often they are clinics located in schools or near school grounds, and they typically provide preventive health maintenance, primary health and mental health care, and acute care treatment for students. Families and employees within the district often access primary care at school-based health clinics sometimes these clinics are open to residents of surrounding communities. To address the urgent need for more health care services for uninsured children and families in the Rio Grande Valley, the Edinburg Consolidated Independent School District (ECISD) partnered with Doctors Hospital at Renaissance (DHR) in July of 2015 to open a school-based health clinic. The clinic was built to provide easy access to health care providers who can diagnose and treat most minor health conditions. All ECISD students and their families, regardless of health insurance or immigration status, can access care at the clinic on a sliding scale basis. Clinic staff help identify children who are eligible for but not enrolled in health coverage through Medicaid and CHIP. The clinic’s financial counselors help families apply for health coverage for the students who may qualify for Medicaid and CHIP, and refer family members to other community agencies as needed. This ECISD/DHR partnership has been key to elevating health care access in this community. DHR, the largest health system in South Texas, invested in a state of the art health clinic and committed staff to serve the children and families in Edinburg. DHR also supports the district’s health care priorities and delivery capacity. The ECISD/DHR partnership has also inspired other health care providers in the region to get involved, including the donation of a mobile clinic now bringing health care services to some of the district’s most remote and rural families. Houston ISD, with nine school-based health clinics, has a partnership with the Texas Children’s Mobile Clinic Program to provide free comprehensive health care to uninsured children at schools with a high rate of children receiving free and reduced lunch. On dates when mobile clinics are scheduled to be on campus, the health outreach worker offers health insurance application assistance to families and connects them with other local health care resources while their children are receiving health services in the mobile unit. For children who do not qualify for Medicaid or CHIP, referrals are made to local community health centers. This Houston ISD/Texas Children’s Mobile Clinic partnership helps with two common challenges of enrollment: 1) Ensuring parents make and keep appointments for application assistance by meeting with them during the time their child is seen by the clinic staff, and 2) Providing an opportunity to dispel myths and misconceptions related to families with mixed immigration status. Undocumented parents are less likely to apply for health coverage for their children because of a mistaken belief that their lack of citizenship disqualifies their citizen children for Medicaid or CHIP. Undocumented parents also fear deportation if they apply for Medicaid or CHIP for their children. This partnership gives the outreach worker time to educate families and break down those barriers to enrollment. School districts should also establish partnerships with community health providers to help with enrollment. Partnerships can increase impact and awareness while broadening the school district’s reach to uninsured children and families. Community partners can also provide expertise and guidance to school districts and in some cases support the district’s capacity to meet the needs of their students. Health trade associations and coalitions. New Application Challenges: While these new systems were designed to simplify the eligibility and enrollment process for families, those applying for health insurance for the first time may still find it confusing and intimidating. The role of the health outreach worker or a certified application counselor is to guide families through this process, explain the options to apply for health insurance, the importance of submitting all supporting documents with the application to avoid delays, and explain the eligibility process so families understand the steps and know what to expect. New Application Tips: It is always good practice to provide families before their appointment with a checklist of the documents and information they will need in order to submit a complete application to avoid causing delays in determining eligibility. 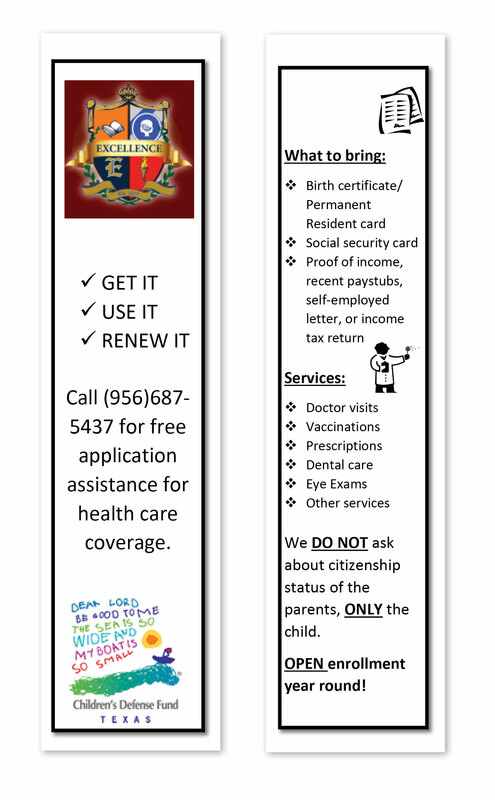 Edinburg Consolidated ISD developed a checklist in the form of a bookmark. Renewal Applications: Families enrolled in Medicaid or CHIP must submit annual renewal applications in order to maintain their health coverage. This is an especially important time to reach out to families, as a lapse in health coverage is common. Referrals: When children apply for health insurance, it is important to be aware of the different needs, medical and otherwise, students and families face, and to have a process and contacts in place to assist with these needs. You may need to seek referrals to either internal or external partners or both, for assistance. Internal Referral: Most of the time you may be able to refer to another department within the school district to assist the family, including a school-based health center, a pupil support program or a family resource center. External Referral: There may be a need to connect the family with resources not offered in the district. An external referral may be made to a Federally Qualified Health Center, often called community health centers, for uninsured children who have immediate medical needs that cannot be met in the district. Or there may be a need for housing assistance information for a student experiencing homelessness or a family that has faced a house fire or flooding. Many states have implemented an information and referral system that allows someone in need of services to access information easily over the phone or internet. An example can be found at www.211california.org. How to Be Strategic in Approaching Partners. Strategic partnership development is a process that requires advanced planning and preparation, negotiation and assessment. Partnerships can fill gaps in services the school district does not have the internal capacity to provide. But it is important to try and determine if a partnership will lead to fruitful gains for both the school and the partner. CDF and AASA adapted a Partnership Assessment Tool to help guide districts towards making key decisions about continuing, improving or ending partnerships. Partnerships require ongoing communication and assessment. Someone should routinely be asking questions and checking in to determine how things are working for both the school and the partner. Lynwood USD in Lynwood, CA currently does not have school nurses at each school site, but every school does have a health clerk. Through an internal assessment of their capacity, the district determined that the health clerks needed training to learn more about the health insurance options available to their uninsured students in order to help facilitate enrollment. Thanks to assistance from a community partner, the health clerks not only learned more about health insurance options, but were also connected with a community agency to help conduct education, outreach and enrollment in their district. While Lynwood USD had recently opened a community health center, in order to meet their needs at the time, they benefited from capitalizing on services offered by community partners. The children and families of Lynwood continue to benefit because the school district took the initiative to connect with outside organizations. Alief ISD, Edinburg Consolidated ISD, and Houston ISD partnered with Children’s Defense Fund- Texas to become Community Partner Program sites for the Texas Health and Human Services Commission (HHSC). Through this partnership school district staff were trained about how to get the most out of the HHSC’s benefits application and management website, www.YourTexasBenefits.com. With this information they can better serve district children and families through the application process and have an increased ability to track and report on the number of families helped, essential for program sustainability. This is an example of how three partners with similar goals worked together to make the enrollment application process more efficient for Texas families and for their own educational programs. The Role of a Memorandum of Understanding (MOU). When two parties become partners it's important to establish key goals, parameters and protocols. A written agreement such as a memorandum of understanding (MOU) can be useful to both school administrators and local health clinics who are working together to reach, educate and enroll children and families in health insurance. The effective date of MOU execution. 1) Complementary Goals: Partnerships work when both parties have identified vested interests that justify the scope of the collaborative. It is critical that once the partnership has been established, both parties work closely to continuously assess goals and objectives, and be committed to making sure both parties’ needs are met and sustained. When school districts set up key systems to support partnership activities, the partnership is less likely to stumble and more likely to yield a productive relationship. 2) Communication: Partnerships are most effective when a point of contact is established at both the school district and the partnering organization. When both parties know their contact person, it enhances relationships and fosters efficiency and trust. The contact person, can facilitate effective communication and channel information to the proper department staff. 3) Flexibility: Both parties should be flexible in defining successes. While enrolling children in health insurance will be the main objective that defines success, it may turn out that one partnership is more effective in carrying out educational workshops for parents. This does not mean the partnership was unsuccessful — it may mean redefining success and changing the goal for that partnership. If partnerships are planned with the future of the relationship in mind, it is important to acknowledge when it should be terminated or simply wind down. That process requires monitoring because some collaborations are designed to achieve a certain objective, and once achieved, or once the window for achieving the objective has closed, it may be time to shut the door. The Mountain View School District in El Monte, CA has been working with CDF and AASA since 2011 when the district embedded a health insurance status question on the school enrollment form. The form requested parental consent to allow the district to refer uninsured children and families to local community partners for enrollment assistance. The district identified a large number of uninsured students in that first year — approximately 1,200 — and committed to increasing local partnerships with community health clinics. The Partnership Assessment Tool served as an effective guide for the district when making hard but critical decisions about partnering agencies. In one instance, after careful assessment, the district concluded that a particular agency lacked the necessary communication skills and reliability to continue a healthy partnership. After this experience, when it came time to find a new partnering clinic, the district had a better idea of the type of partner they needed. Houston ISD is an exceptionally large urban school district encompassing 283 schools and 215,000 students. The district’s Health Services department had a limited number of staff who could assist in identifying and connecting uninsured children to health insurance. Therefore, they sought out planned opportunities that would assist the largest number of families in one setting. One option was the Family Learning Academy hosted by the Family and Community Engagement department (FACE) in the district. Family Learning Academies were held on Saturdays at several high school campuses throughout the district and families were encouraged to attend to learn about the multitude of programs and services offered to Houston ISD students. However, at the first event families were more interested in using the time at the Family Learning Academy to learn more about health coverage options for their children than in enrolling them in Medicaid or CHIP. Rather than opt out of the remaining Family Learning Academy dates, the health outreach team developed a workshop for the academy that would provide the families with the most recent information on children’s health insurance and allowed time after the workshops to answer questions for families who needed assistance. While the Health Services department sought to increase their enrollment numbers through the partnership with Family and Community Engagement, in the end the partnership’s success was in outreach and education. By redefining their metric for success, the team was able to make this partnership work for all involved. Whether the student/family obtained health insurance, what kind and the renewal date. Enrollment Challenges: School-based health enrollment does not come without challenges. Disconnected phone numbers and frequent relocation within and outside the district boundaries make it difficult for outreach workers to find or contact families for follow up. To combat these challenges, school districts found it helpful to ensure that clear instructions about application, enrollment and renewal processes are explained and reinforced. Following up ensures children who have been helped with the application get insured and remain insured. Maintaining a consistent system of communication with families who have been assisted by the outreach team is essential. Sign-in sheets with contact information or a spreadsheet that captures names and phone numbers can be useful in keeping in contact with families. Reporting Challenges: Like many other programs, it is important to evaluate and report on process and outcome metrics. Often programs know they are doing good work, but the challenges of capturing the data on who has applied and been enrolled in insurance are real and daunting. To facilitate this process, the program evaluators for the CDF/AASA school-based outreach and enrollment project, with the help of the planning team, created the Telling Your Story (TYS) Template 35 and the Monthly Reporting Template. 36 These templates were used to help districts track the services schools and partners provided to uninsured families. The TYS Template was designed to capture the process or program implementation details of this work, and the Monthly Reporting Template was used by district teams to track monthly enrollment information. These forms are very important and useful, but it still is challenging to get, track and gather all of the referral and enrollment information between schools and partners. Team leaders must dedicate themselves to communicating and monitoring program process and outcome metrics. Referral Challenges: For schools, one of the trickiest communication paths to monitor and track are referrals to community partners. The first challenge is monitoring and determining whether the child’s needs were met either at the school or with the community partner. Has the child’s family received the needed information and assistance for enrollment? To answer this question, Lynwood Unified School District in California established a systematic approach to facilitate improved communication and tracking between schools and partners.